The API Authentication is implemented as HTTP Basic Authentication over HTTPS. Your API login credentials are not the same as the credentials that you use to login to the web interface. You must obtain your API credentials separately. 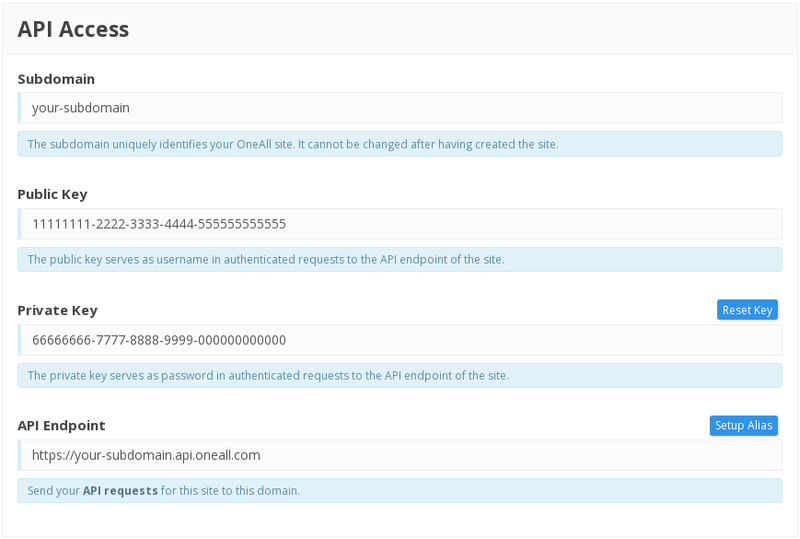 You can find the API credentials in the Settings \ API Settings section of your OneAll Site. Each Site has it's own credentials; you can access the list of your Sites in the web interface. If you haven't created any Sites yet, login to your client account, open the Sites panel and click on Add Site to get started. To get the API credentials for an existing Site, login to your client account, open the Sites panel	and click on the subdomain of a Site. The Public Key is the username and the Private Key is the password in the HTTP Basic Authenticated requests. You have to use HTTP Basic Authentication to confirm your identity via the API. All requests must come over SSL/HTTPS, and have to be sent to the Site Domain. The Site Domain is displayed in the API Settings panel in the Site settings of your OneAll account. More examples are available in our Development Guides.